The Premier League’s oldest player will make his first start in over a year when Crystal Palace attempt to resist the attack that has taken Liverpool to first place. 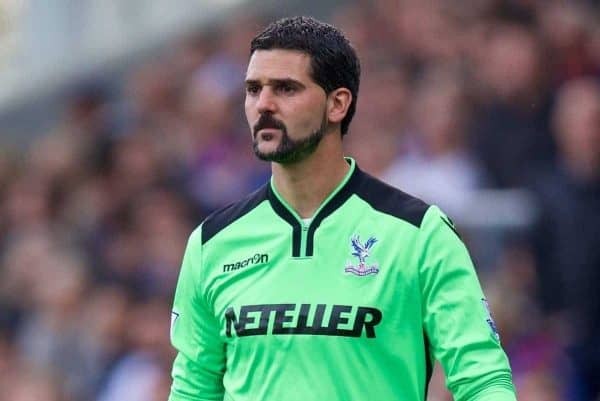 Julian Speroni turns 40 in May and following injuries to fellow goalkeepers Vicente Guaita and Wayne Hennessey in last week’s defeat by Watford will start for the first time since December 2017. Palace are close to concluding the loan arrival of 21-year-old Brazilian Lucas Perri from Sao Paulo to provide them with further options in a move their manager Roy Hodgson insists is unrelated to the injuries to Guaita and Hennessey. He also confirmed he still hopes to recruit a new striker and midfielder, but of his return to his former club, he is unconcerned about promoting Speroni against so prolific a team despite him conceding three goals in a defeat by Arsenal the last time he played. “It’s a tough ask, there’s no question of that,” said Hodgson, with Liverpool having scored 50 times in 22 league fixtures. “In an ideal world you’d not be thrusting him in, you’d hopefully be easing him in, but we’ve no choice. “He’s happy to have the chance and I’m pretty sure he’ll be working very hard to make certain he stays in contention, even when the other two are fit. “But that hasn’t bothered me particularly. Julian is a very, very active goalkeeper, certainly in training. I don’t notice any difference in him from when he played a year ago; I’m happy that we’ve got him. He’s looking forward to it, has confidence in himself.